Rice is a great way to get a delicious, healthy dinner on the table quickly and know that the entire family will love it. Whether you create your own rice recipes or use one of Uncle Ben’s Recipes (http://www.unclebens.com/Recipe/Index), rice is the perfect base for a healthy, low-fat dinner. In large skillet or wok, sauté onion and celery in olive oil until onions are translucent. Add garlic and mushrooms and cook until mushrooms become tender. Add rice and water chestnuts and cook one minute longer. Add chicken, peas and carrots, broccoli, Tamari and ginger. Stir and simmer until heated through, about 3 – 5 minutes. In a greased 9×13 baking dish, spread rice in a layer on the bottom. Top with chicken, mushrooms and broccoli florets. In a small saucepan, sauté onion in olive oil. When onion is translucent, add cornstarch. Stir gently while slowly adding milk. Cook over medium heat until sauce thickens. Add ½ cup of parmesan cheese, pepper and Dijon mustard. Stir to combine. Pour sauce evenly over the rice mixture in the pan and bake 20 minutes at 350 degrees. Sprinkle remaining Parmesan cheese over top of casserole. Bake an additional 10 -15 minutes or until the cheese is bubbly and the dish is heated through. 1 teaspoon cumin Combine rice, green chilies and 1 cup of the cheese. Spread in the bottom of a greased 9×13 baking dish. Let cool slightly while preparing remaining ingredients. Combine corn, beans, diced tomatoes, onion, chili powder and cumin in small bowl. Spread on top of rice crust. Top with chicken and cheese. Bake 15-20 minutes until cheese is melted and toppings are heated through. The recipes are simple and easy to follow. 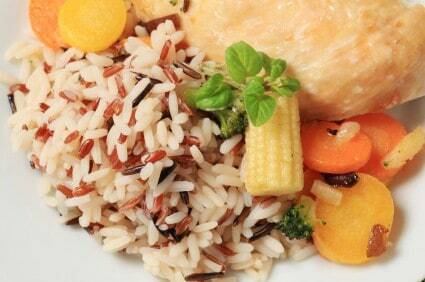 My family loves rice and with this variety, they will surely enjoy more….